From water attractions, delicious dining, resort activities to an amazing housekeeping staff, The Caravelle has you covered. The block long poolscape available at the main Caravelle building is a terrific spot to enjoy the warm glow of the South Carolina sun. The Caravelle also boasts numerous dining options including the Santa Maria Restaurant, which features a delicious breakfast buffet every morning, and the Marco Polo Pool Bar out on the pool deck. To top it all off, The Caravelle offers a 7th floor Sun Deck perfect for sun bathers. The Caravelle has all the family friendly amenities you need for your perfect beach vacation. Read more about our generous resort amenities below. The famous block long poolscape is where to see and be seen at The Caravelle Resort with the large heated pool, whirlpool, lazy river, kiddie lazy river and the Wild Water Pool. Reaching from near the beach access all the way to Ocean Boulevard, this giant poolscape is popular among Caravelle Resort guests. Grab a lounge chair and relax poolside or take a dip in the large, seasonally heated outdoor pool for a refreshing swim. If you are looking to relax, the large outdoor hot tub is heated to sooth your muscles as you get away from it all. Looking for some floating relaxation? The three-foot deep lazy river, heated seasonally, is the perfect place to unwind with the provided inner tubes. Children can enjoy the adjacent one-foot deep kiddie lazy river, which is heated seasonally. Children also love the highlight of the outdoor pooldeck – the Wild Water Pool. Featuring dump buckets and splashing fun, this pool is one-foot deep and is heated seasonally. The block-long poolscape is just steps away from The Caravelle Resort’s on-site dining options including the seasonal Marco Polo Pool Bar and Grill and Pirate’s Cove Ice Cream and Sandwich Shop, where you can stop for a bite to eat after your fun in the sun. Take a tour of the pool deck! Featuring bucket dumps, sprays and fountains, our Wild Water Pool is a popular spot to cool down and have a blast on a warm beach day! Located on the block-long pooldeck, this kid-friendly pool is adjacent to the large outdoor pool. With nearby lounge chairs for parents and children to relax, this pool is great for cooling off on a hot summer day. Heated seasonally to about 82 degrees and filled with one foot of water, kids can duck under the spouts from the multiple parrots perched above and try to avoid getting drenched from the giant overhead dump buckets that turn over when they are filled with refreshing water. Duck under the spray apparatuses and swing under the mushroom fountain for a splashing good time at The Caravelle Resort in Myrtle Beach! When you are finished enjoying the Wild Water Pool, you are just steps away from the lazy river, hot tub and so much more. The indoor pool at the main Caravelle Resort building is open for year-round fun, no matter what the weather is like outside. Step into the heated oasis and dip your toes in the water or take a refreshing swim on a hot summer day. The pool is heated to about 82 degrees and is located on the 7th floor with stunning views of the area, which can be seen through the giant floor-to-ceiling windows. If you want to relax, the indoor pool is accompanied by an indoor hot tub. Step just beside the indoor pool complex to find an additional hot tub, located outside, which is heated to about 102 degrees for a relaxing soak any time of year. The Carolina Dunes oceanfront condos feature a seasonal but exclusive oceanfront pool and kiddy pool. This relaxing pooldeck features lounge chairs, a couple of tables with umbrellas and plenty of space for guests to relax and enjoy the South Carolina sun. Ranging from three feet to five feet, this pool is perfect for a variety of ages. Being just steps from the ocean, you can easily head to the beach after a swim in the pool. All guests of Carolina Dunes renting at The Caravelle Resort are also welcome to use the amenities at The Caravelle Resort building, located just next door! See full room layouts, current specials, and resort amenities by visiting the Carolina Dunes Website. The St. Clement's building features an oceanfront pool deck with accompanying St. Clement's pool bar for a relaxing day in the sun. This pool features lounge chairs complete with breathtaking ocean views. With depths ranging from three feet to eight feet on the deep end, families are able to enjoy this quiet and relaxing pooldeck during their St. Clement’s vacation. Situated on the north side of the building you will not only be steps away from your room but also just steps away from the ocean. All guests of St. Clement's renting at The Caravelle Resort are also welcome to use the amenities at The Caravelle Resort building! Guests of the Arbor building can relax on the serene pool deck located a block from the beach and right outside your door. This seasonal pool goes up to eight feet deep and features sparkling blue water. Here you can enjoy a book while lounging poolside or take a refreshing swim. This quiet pool is located in more of a neighborhood setting, making it the perfect place to relax away from the hustle and bustle of the beach. Guests of the Arbor building renting at The Caravelle Resort are also welcome to use all of the amenities at The Caravelle Resort building! The indoor-outdoor pool at Caravelle Tower offers the best of both worlds. Swim in the Carolina sun to enjoy the heat or if you need a little shade just swim to the other side of the pool and go indoors! Located on the south side of the building and just steps away from the main Caravelle Resort, this pool is the perfect place to take a dip. Heated seasonally to about 82 degrees, this pool features outdoor lounge chairs as well as indoor tables and chairs where you can relax poolside. The Caravelle Tower pool ranges in depth from three to four feet. All guests of Caravelle Tower renting at The Caravelle Resort are also welcome to use all of The Caravelle Resort building amenities! The Caravelle Resort guests of Harborside can enjoy their own private pool to take a relaxing dip or are also welcome to stop over at The Caravelle Resort building and take advantage of all of the amenities there! Reaching a depth of eight feet, the Harborside pool is a great place for a refreshing swim or to just dip your toes in. With plenty of lounge chairs and nice afternoon shade, this quiet pool is located on the north end of the building with easy access from your accommodations. The Sea Mark Tower offers a beautiful pool deck next to a marsh setting and is just one block from the ocean. Featuring a large outdoor pool that starts at just three feet and plenty of lounge chairs for relaxing, this pooldeck is a favorite among Sea Mark Tower guests. A handful of tables with umbrellas are also available for an afternoon picnic. If you want to relax your muscles, check out the three-foot deep hot tub, located just steps away from the pool. Just right outside the Sea Mark Tower and a short walk from the beach, you are sure to find relaxation at the Sea Mark Tower pool deck! All guests of Sea Mark Tower renting at The Caravelle Resort are also welcome to use all of The Caravelle Resort building amenities! The brick pool deck at St. John's Inn is a great place to relax and bask in the Myrtle Beach sun with the large swimming pool and hot tub. Exclusive to St. John’s Inn guests, this pooldeck is a quiet retreat for those visiting the beach. Take a dip in the giant pool, which ranges from three to 12 feet for a refreshing swim on a hot summer day. Or, lounge poolside at one of the many lounge chairs or grab a seat at one of the patio tables shaded by an umbrella. The relaxing hot tub is located just steps away from the pool and is heated seasonally to about 102 degrees. Let this sprawling pooldeck be your best kept secret! All guests of St. John's Inn renting at The Caravelle Resort are also welcome to use all of The Caravelle Resort building amenities! The Santa Maria Restaurant, winner of TripAdvisor's Certificate of Excellence, has long been a Myrtle Beach favorite, offering the finest Southern-style breakfast buffet that you can find in Myrtle Beach as well as top-notch lunch and dinner fare. Located just off Ocean Boulevard at the main resort building, this restaurant is easily accessible from both the main and surrounding Caravelle Resort buildings. Take a seat in the spacious dining room for our year-round breakfast buffet - the perfect start to your morning. Santa Maria features a famous made-to-order omelet and Belgian Waffle station plus all the regulars such as grits, toast, eggs, biscuits and gravy, fresh fruit, cereal, yogurt, juice, coffee and so much more! The breakfast buffet can be purchased in advance for a discounted rate or at the door. Santa Maria Restaurant is also a great place to enjoy a sit-down lunch or dinner with the family and also includes a full bar selection, free Wi Fi access, flat screen TV’s and the full NFL Package. Our Myrtle Beach restaurant features an array of drinks and top-notch menu items which can be enjoyed inside or outside on our comfortable patio on Ocean Boulevard. Choose from appetizers such as fried green tomatoes, mussels, chicken tenders, nachos and more. Santa Maria also serves up fresh salads for lunch and dinner such as an apple walnut salad and Caesar salad. We offer tasty sandwiches including Thai shrimp wrap, the Philly, and Carolina pulled pork, as well as mouth-watering burgers including the signature Caravelle burger. Jumbo wings with a variety of sauces and personal flatbread pizzas with an array of toppings are also available. Dinner entrees include blackened salmon, chicken pasta, New York strip and BBQ pork chop. Our Myrtle Beach restaurant also serves up a lunch and dinner kids’ menu for ages 10 and younger with such options as hot dogs and grilled cheese with fries. Santa Maria features a variety of non-alcoholic drinks including sodas and tea as well as domestic and imported beers, wine and cocktails. Santa Maria can also be booked for your next group event, seating up to 125 people in a banquet setting or up to 200 in a reception setting. During the summer Santa Maria also offers a variety of specialty dinners including our Friday Night Fish Fry and our Saturday Steak Out. *Hours of operation and menu options may vary. See the front desk for more information. Take a tour of Santa Maria Restaurant! Stop by the Marco Polo Pool Bar and Grill for a cool beverage on a hot beach day, or grab a delicious and convenient bite to eat so you can get back to soaking up the rays. The Marco Polo Pool Bar offers daiquiris, smoothies (with or without alcohol), beer and other adult and non alcoholic beverages. This hot spot is perfect for a thirst quenching beverage on a hot summer day or for grabbing a few drinks before hitting the town. The Marco Polo Grill serves all of your favorite beach fare like char-grilled burgers, sandwiches and wraps, gourmet hot dogs, and more. Both are conveniently located between the block long poolscape and the ocean. The Marco Polo Bar operates on a seasonal schedule (weather permitting) and the Grill is open during our warm summer months. The Pirate's Cove Ice Cream and Sandwich Shop is a popular spot to take a break from the warm summer sun with a cool hand dipped ice cream cone or decadent ice cream sundae. Perfect for a warm-weather snack or an after dinner treat, the ice cream shop is the place to be during hot summers at The Caravelle! Pirate's Cove is also a great lunch spot. Guests can enjoy great sandwiches and wraps, salads, pizza by the slice, and more! The Pirates Cove is located beside the block long poolscape in the main hotel and maintains a seasonal warm weather schedule. 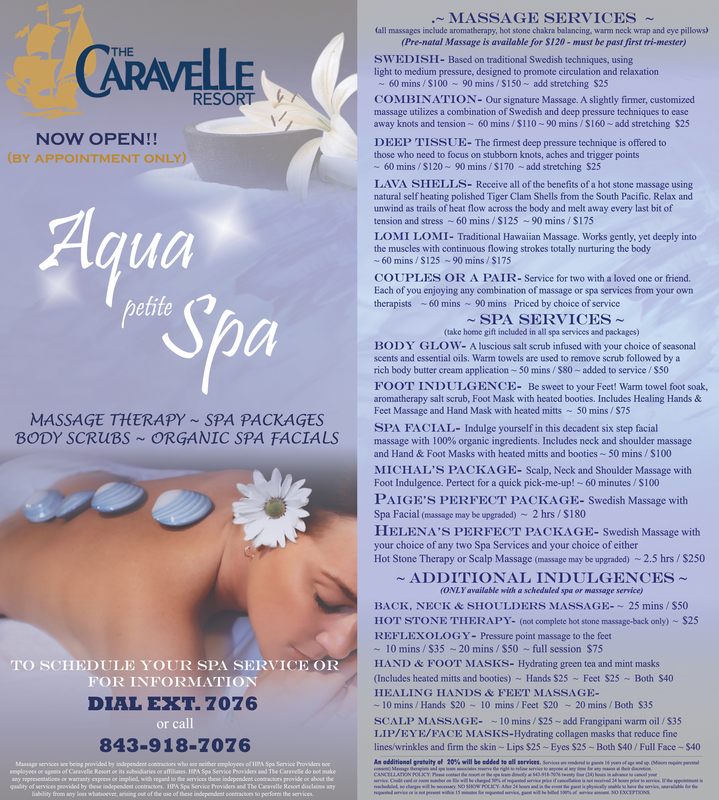 The Aqua petite Spa, located at The Caravelle Resort, is open by appointment only and offers a variety of services including massage therapy, spa packages, body scrubs and organic spa facials to help you relax during your vacation. 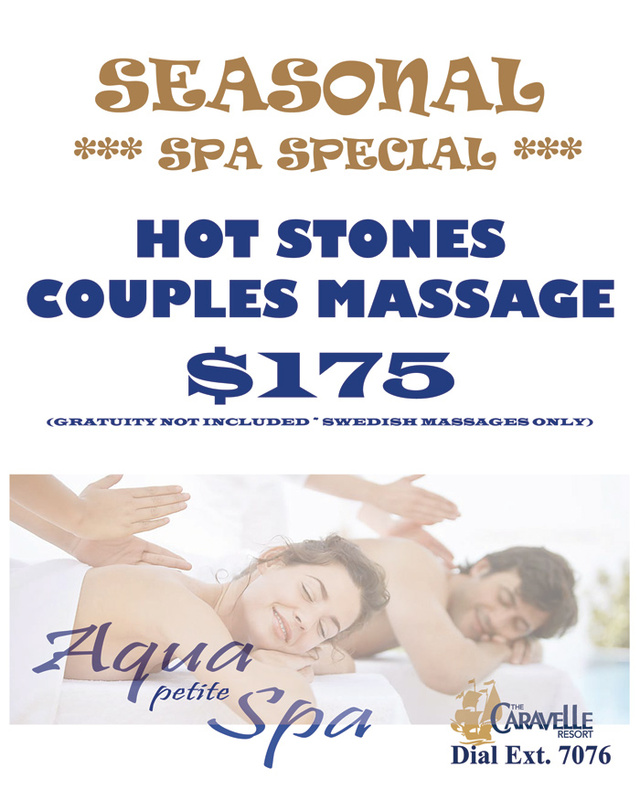 Choose from a variety of massage options like the Romantic Couple's Massage, Lomi Lomi, a traditional Hawaiian massage, and Lava Shells, which utilizes Tiger Clam Shells. Let all your worries and stress drift away as you enjoy a 60 or 90 minute massage, without even having to leave the property. Additional spa services include reflexology, scalp massage, facials, salt scrubs and more. To view available services and prices, click here for the full menu or click here to view their current special offer. For more information call 843-918-7076 or dial ext. 7076 from your room phone. The Sun Deck at Caravelle Resort is a totally unique amenity that many guests just can't get enough of! Located on the 7th floor, the outdoor sun deck offers a spacious outdoor deck area lined with comfortable beach chairs for your enjoyment. Guests love to come up to the sun deck to enjoy the peace and quiet, soak up the sun, and take in the uninterrupted Myrtle Beach vistas. Be sure to check out this unique amenity during your stay at Caravelle Resort! The Caravelle Resort offers fun and exciting kids activities all summer long at the main building! Every day offers something new and exciting! Activities vary between beach activities, pool activities, and deck activities and are all geared towards kids between 5 - 12 years old. Plus, most of the activities are completely free for guests! 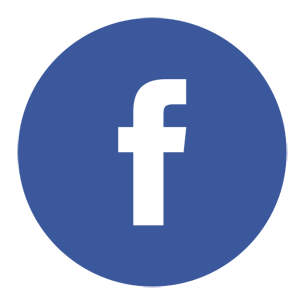 Ask one of our front desk attendants for more information on specific activity schedules and how you can get involved. The Caravelle Resort Kids Club is just one of the many reasons we are considered one of the most family kid friendly resorts in Myrtle Beach! Be sure to check out our other family friendly amenities that are included with your stay. *Select activities such as friendship bracelets may have a small fee. See the front desk for more information and for an up-to-date schedule of The Caravelle Resort activities and special events. Our on-site golf department can arrange for a tee time at any of the nearly 100 Myrtle Beach area golf courses, including 10 of America's top 100 public courses for great rates. Located at our check-in building across the street from the main resort, golf can be booked after you arrive or before your arrival. If you’d like to book your room in conjunction with your golf, a variety of golf packages are available and may include Prime Time Rewards Package, Barefoot Free Round Package and Dunes Club Package. Custom packages are also available which include daily green fees, your accommodations at The Caravelle Resort, on-site breakfast and a welcome gift. Looking for a golf quote? Click here to fill out our Golf Quick Quote form. Guests of The Caravelle Resort have exclusive privileges to the The Dunes Golf and Beach Club and can experience being a member for the day at this world renowned facility. *Packages are subject to change. Looking to stay fit during your vacation? If so, be sure to check out the Caravelle Resort Fitness Room, located on the first floor of the main Caravelle Resort building. With state of the art treadmills, elliptical machines, exercise bikes and universal gym our fitness room can help you burn those vacation calories! The Caravelle Fitness Room is open year-round for guests to use at their leisure. Take a tour of the fitness room! The Caravelle Resort Game Room features the hottest arcade games and is a favorite among children and adults alike. Popular game room activities include air hockey, spikeout, Galaga, racing car games, and much more! Perfect for a rare rainy beach day or for when you just need a break from the salt and the sand, the game room is the ideal place for family fun. The Caravelle game room is located on the lobby level and is open throughout the year for your enjoyment. Have a document you need to print or just want to check your emails? The Caravelle Resort Business Center offers you the ability to do just that. Located directly off the lobby in the main Caravelle Resort building, the Business Center offers several public computers that are available to all Caravelle guests free of charge. The Business Center is accessible via your Caravelle room key.